In my last post, I demonstrated how to use putexcel to recreate common Stata output in Microsoft Excel. Today I want to show you how to create custom reports for arbitrary variables. 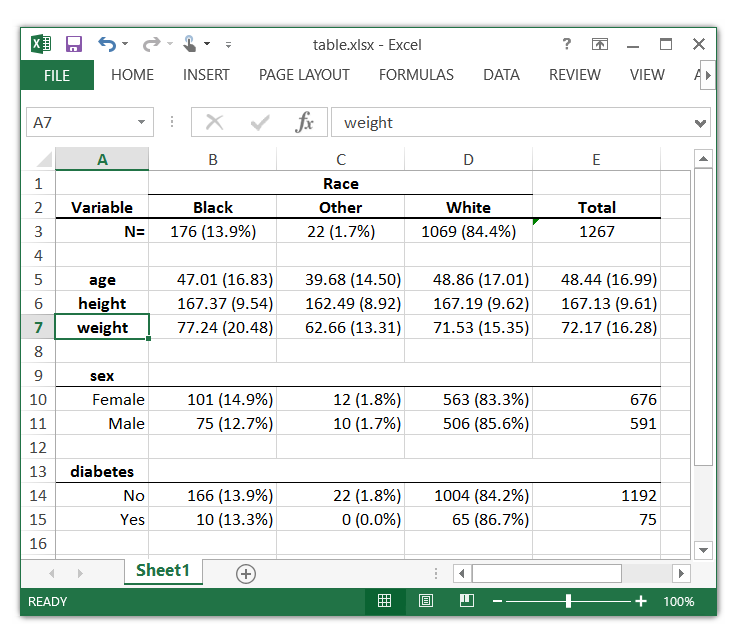 I am going to create tables that combine cell counts with row percentages, and means with standard deviations. But you could modify the examples below to include column percentages, percentiles, standard errors, confidence intervals or any statistic. I am also going to pass the variable names into my programs using local macros. This will allow me to create the same report for arbitrary variables by simply assigning new variable names to the macros. You could extend this idea by creating a do-file for each report and passing the variable names into the do-files. This is another important step toward our goal of automating the creation of reports in Excel. In my last post, I showed how to use putexcel to write simple expressions to Microsoft Excel and format the resulting text and cells. Today, I want to show you how to write more complex expressions such as macros, graphs, and matrices. I will even show you how to write formulas to Excel to create calculated cells. These are important steps toward our goal of automating the creation of reports in Excel.